Jacques-Charles Dupont de l'Eure (French pronunciation: ​[ʒak ʃaʁl dypɔ̃ də lœʁ]; 27 February 1767 – 3 March 1855) was a French lawyer and statesman. He is best known as the first head of state of the Second Republic, after the collapse of the July Monarchy. Born in Le Neubourg, Normandy, he was a lawyer at the parlement of Normandy when the French Revolution began. During the First Republic and the First Empire, he filled successive judicial offices at Louviers, Rouen and Évreux. He had adopted revolutionary principles, and in 1798 began his political life as a member of the French Directory's Council of Five Hundred. In 1813 he became a member of the Corps législatif and, during the Hundred Days, was vice-president of the chamber of deputies. When the Seventh Coalition armies entered Paris, he drew up the declaration asserting the necessity of maintaining the principles of government that had been established at the Revolution. He was chosen as one of the commissioners to negotiate with the Coalition sovereigns. From 1817 until 1849 (through the Bourbon Restoration and the July Monarchy) he was, without interruption, a member of the chamber of deputies, and he acted consistently with the Liberal opposition, of which he was the virtual leader. For a few months in 1830 he held office as Minister of Justice, but, finding himself out of harmony with his colleagues, resigned before the end of the year and resumed his place in the opposition. When the 1848 Revolution began, Dupont de l'Eure was made President of the provisional assembly, being its oldest member. On the same day, he was made President of the Provisional Government, becoming France's de facto Head of State. He can therefore be considered as France's first Presidential Head of State, though Louis-Napoléon Bonaparte, later in the same year, was the first to formally bear the title of President of the French Republic. His prestige and popularity prevented the heterogeneous republican coalition from having to immediately agree upon a common leader. 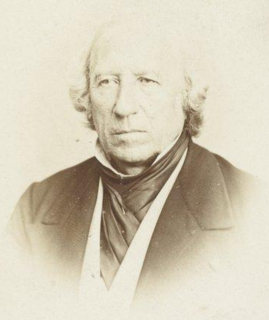 Due to his great age (upon entering office, he was just a few days short of his 81st birthday), Dupont de l'Eure effectively delegated part of his duties to Minister of Foreign Affairs Alphonse de Lamartine. On 4 May, he resigned in order to make way for the Executive Commission, which he declined to join. He supported Louis-Eugène Cavaignac against Louis-Napoléon Bonaparte. In 1849, having failed to secure his re-election to the chamber, he retired from public life. His consistency in defending the cause of constitutional liberalism throughout the many changes of his times gained him the respect of many of his countrymen, who referred to Dupont de l'Eure as "Aristides of the French tribune". Wikimedia Commons has media related to Jacques Charles Dupont de l'Eure. ^ a b c d e f One or more of the preceding sentences incorporates text from a publication now in the public domain: Chisholm, Hugh, ed. (1911). "Dupont de l'Eure, Jacques Charles" . Encyclopædia Britannica. 8 (11th ed.). Cambridge University Press. p. 688. Eure is a department in the north of France named after the river Eure. Emmanuel Joseph Sieyès, most commonly known as the abbé Sieyès, was a French Roman Catholic abbé, clergyman and political writer. He was one of the chief political theorists of the French Revolution, and also played a prominent role in the French Consulate and First French Empire. Jean-Jacques-Régis de Cambacérès, duc de Parme, was a French nobleman, lawyer and statesman during the French Revolution and the First Empire. He is best remembered as one of the authors of the Napoleonic Code, which still forms the basis of French civil law and French-inspired civil law in many countries. The Coup of 18 Brumaire brought General Napoleon Bonaparte to power as First Consul of France and in the view of most historians ended the French Revolution. This bloodless coup d'état overthrew the Directory, replacing it with the French Consulate. This occurred on 9 November 1799, which was 18 Brumaire, Year VIII under the French Republican Calendar. The French presidential election of 1848 was the first ever held. It elected the first and only president of the Second Republic. The election was held on 10 December 1848 and led to the surprise victory of Louis-Napoléon Bonaparte with 74% of the vote. Charles Henry Dambray was chancellor of France, minister of justice, and president of the chamber of peers during the short lived restored French Royalist government of 1814 and 1815. Noël Jacques Lefebvre-Duruflé was a French politician who became Minister of Agriculture and Commerce in the French Second Republic, and under the Second French Empire was Minister of Public Works. In the French Third Republic he was convicted on a corruption charge. Michel Goudchaux was a French banker and politician who was twice Minister of Finance during the French Second Republic. A firm Republican, he refused to accept the government of Napoleon III. The Provisional government was a short-lived government formed on 24 February 1848 at the start of the French Second Republic, after the Cabinet of François-Pierre Guizot and the July Monarchy had been thrown out of power. It was succeeded by the Executive Commission of 1848. The French Provisional Government of 1814 held office during the transitional period between the defeat of Napoleon followed by the surrender of Paris on 31 March 1814 and the appointment on 13 May 1814 of the Government of the first Bourbon restoration by King Louis XVIII of France. The Moderate Republicans were a large political group active from the birth of the French Second Republic (1848) to the collapse of the Second French Empire (1870).